On a wet and windy August morning last year, Sergeant Gratton from 32 Section, Special Investigation Branch in Bulford, came across an injured lady in Shipton Bellinger. The lady had been out walking her dog but, due to the heavy rain, had slipped and fallen down a bank, fracturing her ankle. Cold, wet and unable to move, she called 999 for help. Sgt Gratton immediately began comforting her and alerted Corporal Janney, who arrived soon after. Both sprang into action, sheltering her from the heavy rain and reassuring her that help was on the way. Hampshire and Isle of Wight Air Ambulance (HIOWAA) were dispatched, and the Critical Care Team Vehicle arrived minutes later. HEMS doctor, Louisa Chan, and Specialist Critical Care paramedic, Oliver Saddler, immediately began treating the patient. Both Sgt Gratton and Cpl Janney stayed to assist our Critical Care Team and helped to lift the patient to a waiting ambulance. 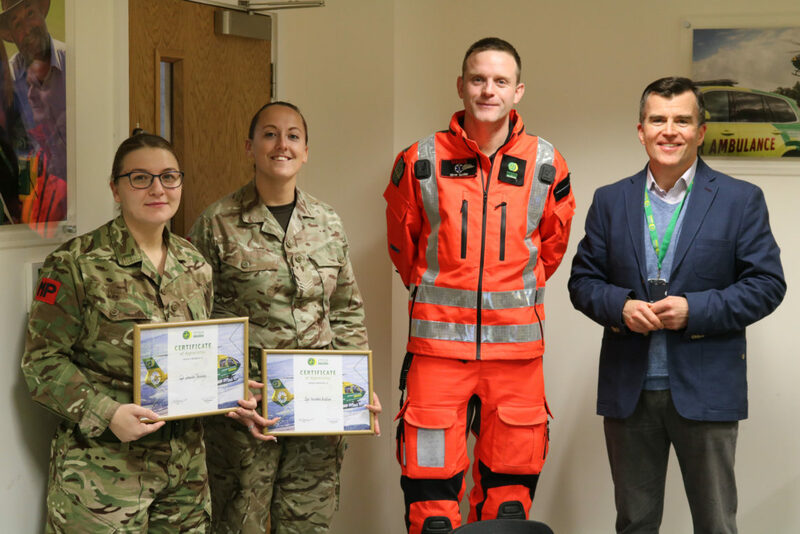 Dr Chan and Specialist paramedic Oliver Saddler were so impressed by the actions Sgt Gratton and Cpl Janney had taken, that they decided to nominate them both for a prestigious charity award. 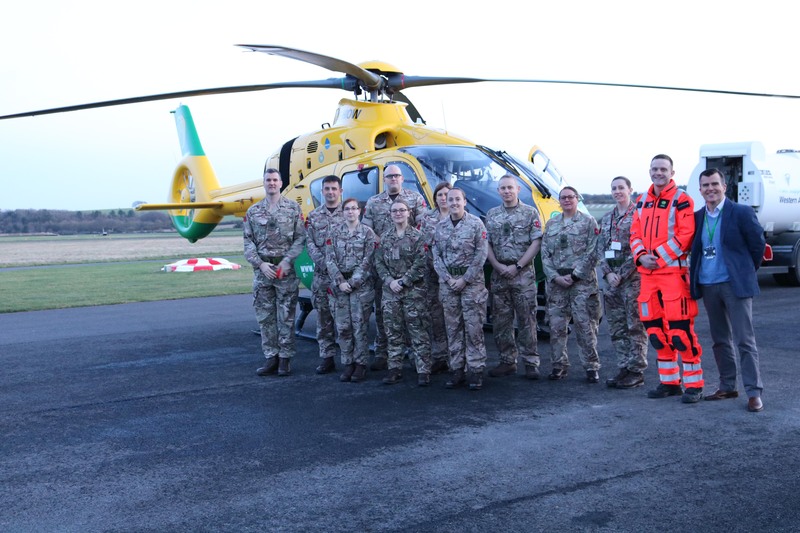 Sgt Gratton, Cpl Janney and their colleagues from 32 Section SIB company, stationed at Bulford, were invited to the Charity Airbase in Thruxton on Thursday 17th January, where Hampshire and Isle of Wight Air Ambulance Chief Executive, Alex Lochrane and Specialist paramedic Oliver Saddler, showed them around the base and presented them both with a Certificate of Appreciation. The certificates are awarded occasionally to anyone who we believe has gone that extra mile and has acted in a way that exemplifies our charity values of Teamwork, Dedication, Openness and Professionalism.